I’ve decided to begin listening to the number one album from 30 years ago each week and then write a little bit about it here. Why isn’t terribly important, other than it will hopefully be mostly entertaining, always enlightening, and occasionally fruitful. However, here are a few reasons. I recently had my 31st birthday, and birthdays are always opportunities to ponder the passage of time. Presumably, I should have then decided to look back 31 years, but that makes the math harder (and thinking hurts) so I’ll keep it at 30 years. Looking at the current top list of albums, much of it is stuff I definitely wouldn’t listen to on my own volition. I doubt that in 30 years it will be judged to be any higher quality. In this sense, I could do this exercise with current music. But by going back in time I’m, exposing myself to new music that isn’t currently on the radio (for the most part), so it has extra novelty. I already know the general direction of popular music over the last 30 years, so it will be interesting to see the progression in more detail with this foreknowledge. I haven’t fully fleshed out the rules of this. For example, if an album is number one for more than one week, I think I’ll drop down to the second place album, or beyond. There will be other rules about if I’ve already listened to an album (for example if it oscillates up and down from number one). This week I listened to Barbra Streisand – Guilty. The fact that this is the first album in this experiment made it very difficult to begin. I was not a fan of her work, and my opinion hasn’t been improved. First some observations about this album. The cover shows Barbra with Barry Gibb, of the Bee Gees. They sing duets on two of the nine of the tracks, which seems to be an awfully low ratio for him to be featured on the cover*. Also, he doesn’t really sing in his trademarked joyful falsetto, which is more false advertising. To me, that’s 100% of his appeal, so without it, who cares? Furthermore, I’m not clear what anyone is guilty of in this album, besides being boring and uninspiring. A few of songs have enough to them that the could serve as adequate background music during a Roger Moore Bond film, but certainly not during the introduction to a Bond movie. Most songs are Celine Dion-esque and are about strong women looking for love, but probably only appeal to women that are nothing like that. I’m missing the genetics and personality to appreciate it. I’m planning on at least making a real effort to see this idea through for a while, but this is an inauspicious beginning. Configuring OpenVPN on Ubuntu 8.04 LTS – Enter mkdir -p /dev/netEnter mknod /dev/net/tun c 10 200Enter chmod 600 /dev/net/tunEnter cat /dev/net/tun to test whether the TUN/TAP device is available:If you receive the message cat: /dev/net/tun: File descriptor in bad state your TUN/TAP device is ready for useIf you receive the message cat: /dev/net/tun: No such device the TUN/TAP device was not successfully created. Gigagalaxy Zoom – A zoomable, panable image of our galaxy. It’s show-and-tell time! Below are two movies I made using the volume rendering tools of yt. I’ve been using yt for a few years to analyze and visualize the cosmological simulations I make with Enzo, and only recently have I had time to begin to play with the new volume rendering stuff. The first movie is a slow rotation around the entire volume of a simulation at a contemporary epoch, which means that this image is produced from the state of simulation at its end, 13 billion years after it started. The colors correspond to the density of matter in the volume, from dark blue to white as density increases. The simulation is a periodic cube with dimensions 20 Mpc/h on a side. In comparison, the diameter of our galaxy is somewhere around one thousand times smaller. This means that the whitest areas correspond to clusters of galaxies, and our galaxy would be just a small part of one of the white blobs. Be sure to watch the movie full screen! Below shows the time evolution of the simulation from beginning to end. This is a thin slab of the center of the simulation (10% thickness) viewed from a corner of the cube. Notice that early on the matter is very clumpy everywhere, but rapidly forms dense knots connected by thin filaments. This is how the real universe looks! After about the half-way point of the movie you’ll notice that not much happens. Again, this is how the real universe looks! Much of the large-scale evolution of the universe was finished about 7 billion years ago. This movie uses comoving coordinates, that compensate for the expansion of the universe. If I were to use proper coordinates, which are the kind we use every day to measure normal things with rulers, the movie would show the simulation starting very small and then blowing up. Again, use the full screen option for the best image. 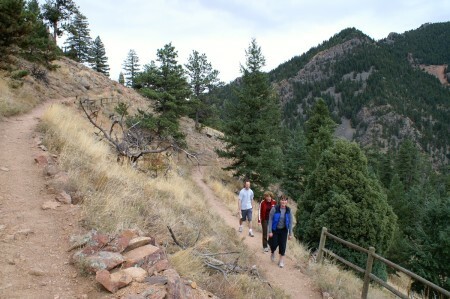 Yesterday I hiked in Eldorado Canyon State Park with Melissa, Megan and Megan’s significant other Chris. This park is just south of Boulder and like much of the front range offers spectacular views. This time of year the trees are well into changing color and dropping leaves. The occasion warranting a hike is that today is my birthday, and since I am all done with graduate school, I have free time to do this sort of thing. I saw this on my walk to school this morning. I don’t know if the scoop is operational, or if the exhaust really runs through the pipe below the door. 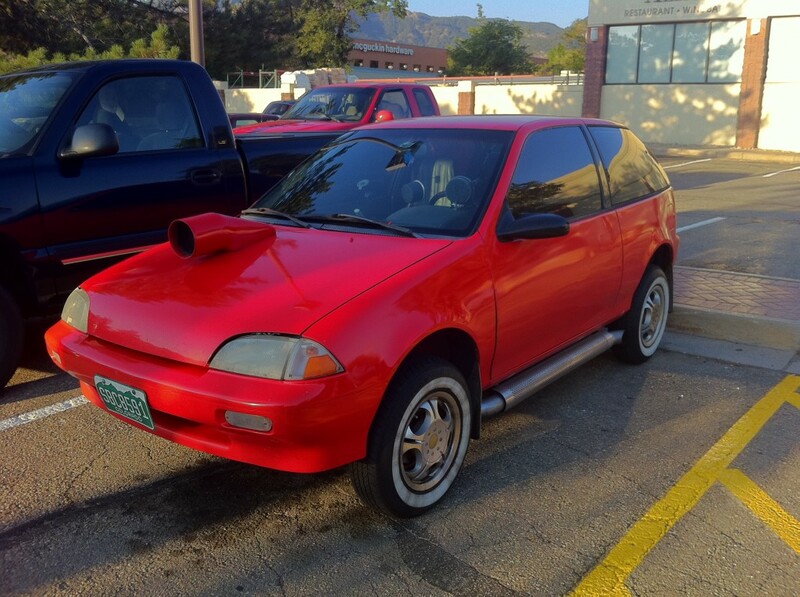 The color isn’t doing it any favors. I do like the white-wall tires, which are a nice and subtle touch (but they could use a wash).